Let’s see, where to start? Well, we celebrated Alexa’s Birthday and the holidays here in Kirkland a few days before Christmas, since we both flew home to spend the 25th with our families for the last time as “single” people (wow, kinda scary, huh?!?!) 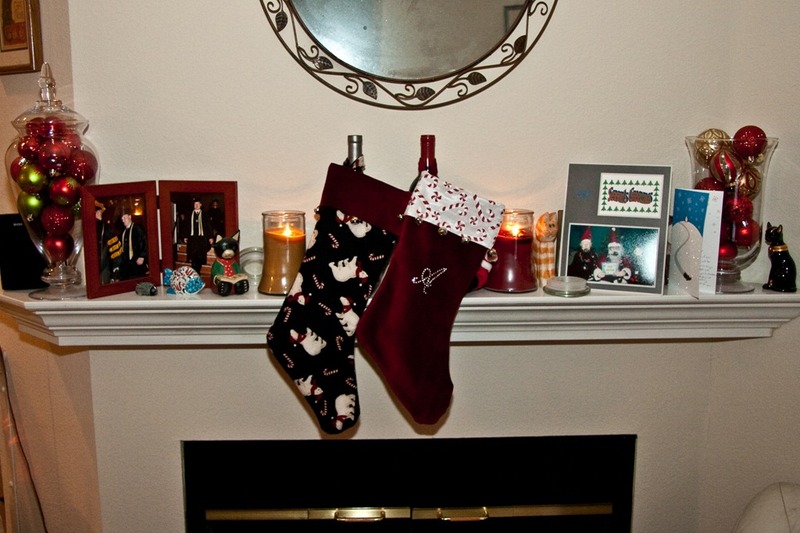 It was great to be home with everyone, but it was a bit odd to be apart – we’re definitely looking forward to spending the holidays together next year :) But to celebrate this year, we chose to make stockings for each other. Yes, we actually sewed them! 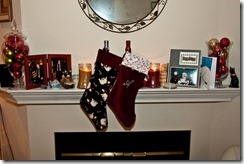 And then of course stuffed them with fun little presents :) We hung them on our improvised stocking holders (random wine bottles) and put them on our mantle. As always, I’ve included a cute photo for you to see! As for wedding planning, we’ve been super busy! We’ve picked Fiore Blossoms as our florist/decorator, chosen our DJ, Wave Link Music, and our invitations are being designed by Dolce Design! Check out all the people working on our wedding on our Twitter list: @APandBBetz/our-wedding-vendors. We’ve also been working on a few cool surprises and fun things we won’t talk about just yet. Gotta have some suspense, right? We did spend a nice afternoon at the Seattle Wedding Show two weekends ago. Ok, yeah, not exactly a guy thing – really, I went to eat all the cake tasters :) Oh, and to have fun with Alexa, of course! There’s still lots more to do, and only a few months left! We know many of you are interested in our registries – we’re furiously working on finishing those up, and should have them all set to go in a week or so. We’ll be sure to post to the blog to let you know. And someday soon, Alexa will start posting on here too – I know you’re all waiting on the edge of your seat!